As Prime Minister-elect, Narendra Modi demonstrates his interest in proactive diplomacy. Earlier this week, we learned that, in a somewhat unusual practice, Narendra Modi and the BJP had decided to extend invitations to the leader of every nation on India’s periphery to the prime minister’s swearing-in ceremony. Modi will be sworn is an India’s 15th Prime Minister on the 26th of May with the strongest parliamentary mandate for any single political party since 1977. As he does so, he wants to demonstrate to India’s neighbors that he is someone they can work with. For a man who had relatively little to say about foreign policy and regional leadership during his campaign for prime minister, his actions since the end of the Indian general elections on May 16 are encouraging. Modi’s brand of proactive diplomacy might be exactly the sort of leadership India needs to assertively pursue her interests in the region and on the world stage. While Afghan President Hamid Karzai and Sri Lankan President Mahinde Rajapaksa were quick to accept Modi’s invitation, the man caught most off guard was Pakistan’s Nawaz Sharif. Modi’s invitation marks the first time a Pakistani prime minister has been invited to the inauguration of an Indian prime minister. Sharif attending Modi’s inauguration would thus be unprecedented historically and would set India-Pakistan relations on a solid footing as the NDA-led coalition takes power in New Delhi. Pakistan’s Prime Minister’s Office will likely issue a statement soon about Sharif’s decision, but based on what “a well-informed high-ranking government official” told the Express Tribune, Sharif is “likely” to attend Modi’s swearing-in. Nawaz Sharif’s government additionally stated that it was ready to respect India’s democratic verdict and work with whatever government was formed following the election. 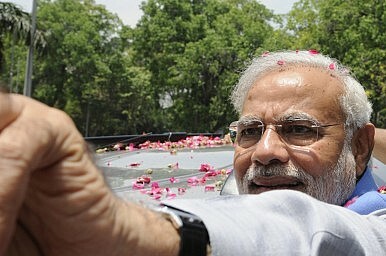 His government alluded to a “new beginning” between India and Pakistan. By attending Modi’s inauguration, both leaders could show that they are committed to advancing bilateral relations between India and Pakistan. A meeting between Sharif and Modi early into the latter’s tenure as India’s 15th Prime Minister will also ensure that the two men gain a sense of what will and won’t be possible diplomatically in the near term. Sharif traveling to New Delhi on the 26th won’t immediately resolve the plethora of issues plaguing cross-border ties, but it would establish a sort of rapport that no two leaders of India and Pakistan have enjoyed in recent history. What is most telling about Modi’s move is that it signals a strong desire to place India at the center of South Asia — not only through the institutional rubric of SAARC (an organization that isn’t known for its ability to influence regional affairs in any real way), but in a broader sense. The invitations render concrete Modi’s aspirations for India within the region. For India to develop economically, it has to become a regional hub commensurate with its sheer size. Under the last ten years of UPA leadership, the Indian government paid little attention to this sort of regional leadership. Why Peace Talks Between India and Pakistan Fell Apart Once AgainIndian Elections 2019: Do Narendra Modi and the BJP Deserve a Second Term?Indian Foreign Policy After the Elections: All Eyes on ChinaSonia Gandhi’s Daughter Enters Indian Politics Ahead of 2019 General ElectionsThe Temple Guardians: Is India’ Ruling BJP Becoming More Conservative?